Thank you for visiting the tarock.net card store! Ordering cards is secure and easy. We ship your cards the next business day! 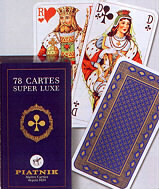 For games that require the 78 card deck.